The first “molecules” made from two photons have been created by physicists in the US. Their experiment involves firing pairs of photons through an ultracold atomic gas, where an attractive interaction causes the photons to stick together and become quantum-mechanically entangled. The breakthrough could allow both conventional and quantum computers to encode and process information using photons. Getting photons to stick together is not easy because they normally pass through each other without interacting. However, a photon has an associated electromagnetic field that can modify its surrounding medium. These changes can affect nearby photons and create an effective interaction between them. Although this effect is usually tiny, the interactions can be significant if the medium is chosen carefully. In the new study, a team led by Mikhael Lukin at Harvard University and Vladan Vuletić at the Massachusetts Institute of Technology has created strong interactions between photons by sending them through a gas of rubidium atoms chilled to a temperature of just a few degrees above absolute zero. 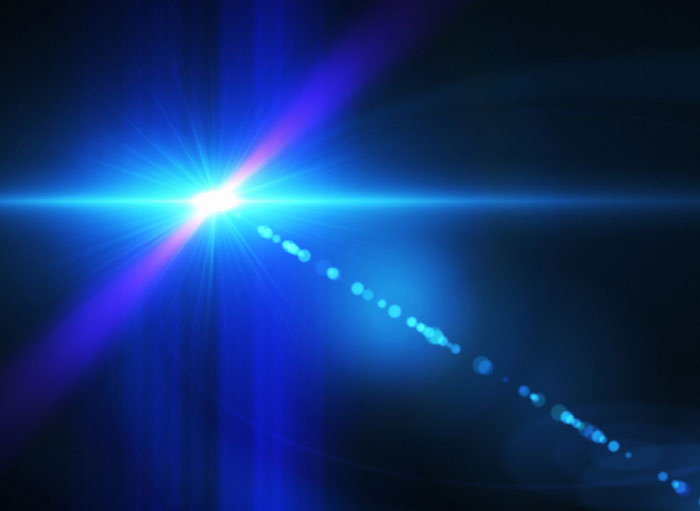 The experiment involved using blue laser light with a carefully chosen wavelength of 479 nm, which modifies the rubidium atoms so that a photon can share some of its energy with several atoms and create a collective “Rydberg state”. This state is like a Rydberg atom – in which an electron is promoted to a very high-energy state – but instead the electron is shared among several atoms. This Rydberg state propagates through the gas like a sluggish photon with a non-zero mass and when the collective state reaches the opposite edge of the gas cloud, the photon re-emerges at its original energy. When a Rydberg state forms, however, it becomes impossible for more Rydberg states to be created nearby, thanks to a process called the Rydberg blockade. So, when two photons are fired into the gas in quick succession, the first forms a Rydberg state but the second does not. As far as the second photon is concerned, the region of the Rydberg state has a different index of refraction than the rest of the gas, which causes the second photon to stay close to the first as they travel together through the gas. The result is a bound state of two photons – or a molecule – travelling through the atomic gas. The team was also able to show that the photons in each pair were entangled in terms of their polarization. The researchers did this by firing pairs of photons with a specific polarization into the gas. As the photons travel through the medium, their polarizations change. By measuring the correlation between the polarizations of the photons, the team was able to show that the photons had been entangled when they formed a molecule. Creating interactions between photons is not just of intrinsic interest; it could also lead to faster and more energy-efficient computers that use light pulses instead of electrical pulses to process information. Today, such systems are impractical because light pulses must first be converted to electrical pulses for processing and then back again, which is very inefficient. If the light pulses could be made to interact with each other, then all-optical logic gates could be made to process information. Photon molecules could also help in the development of quantum computers, which exploit the principle of entanglement to give two particles much stronger correlations than is allowed by classical physics. While photons are very good at transmitting quantum bits (qubits) of information over long distances, the fact that they do not normally interact with each other makes it difficult to create all-optical logic gates. “What it will be useful for we don’t know yet; but it’s a new state of matter, so we are hopeful that new applications may emerge as we continue to investigate these photonic molecules’ properties,” says Lukin.